When it comes to wood fencing and patios, nothing looks better than a fresh coat of stain. If your patio or fencing structure is looking worn and weathered, it’s likely time to pull out the stain bucket. But before you let your brush hit the bucket, you’ll want to get your surfaces pressure washed. Pressure washing your wooden surface prepares the pores of the wood and cleans the surface of any debris that’s caked on over the years. Wood is porous; it absorbs liquids. That’s why some staining jobs take a few coats to get the look you’re seeking. Since wood is porous, any liquid that’s coated on the surface will make it’s way deeper into the core of the wood, and there it’ll dry and stay. 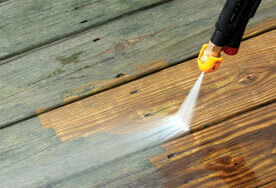 With a power washing job, your wood’s pores open up a bit, allowing for more stain once the wood has dried. With more stain, your stain job will penetrate further into the surface of the wood, leaving you with more thoroughly stained wood that lasts longer. You simply don’t want to stain a dirty deck or fence. Staining over the top of dirt, debris, and mold, can lead to stain failure. Although stain may initially cling to dirt, debris, and mold, it’s likely to flake off as weather and heat effect the wood. Pressure cleaning the surface rigorously preps the surface by pulling all dirt and debris from it. give us a call here at Big Clean. We’ll give you a free quote and set up an appointment for you!